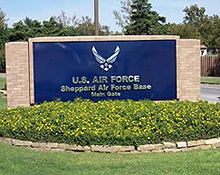 Sheppard AFB is situated approximately 130 miles between Dallas and Oklahoma City. Sheppard Field began as a World War II Army Air Corps Training Center, officially dedicated on October 17, 1941. The field was named for the late Senator Morris E. Sheppard, former chairman of the Senate Military Affairs Committee. Over 60,000 Airmen and personnel from other military branches are trained at Sheppard AFB each year. Its mission is to recruit, train, and educate quality people through military, technical and flight training.